Promoting health has been positioned as an important management issue for Dai-ichi Life so that the company can fulfill its social responsibilities when responding to customers who are hoping to improve their health. This is based upon the awareness that Group officers and employees need to possess a high level of personal interest in health and medical matters. Promoting health is carried out consistently in a top-down manner, from management to each workplace, using a organized structure for health productivity management promoting health management and clarifying the company's management philosophy toward health. Specific measures being implemented include the following: 1. The Group Health Declaration, 2. The construction of an internal plan-do-check-action (PDCA) cycle system, 3. Full participation in health examinations, 4. Lifestyle improvement measures, and 5. Anti-smoking measures. ●The Smart Life Awards is an award system that recognizes distinguished contributions and measures taken with respect to health advancement and the prevention of lifestyle diseases, which centers upon four key themes (suitable exercise, suitable diet, no smoking, and health examinations). These four themes have been established by the Smart Life Project*. This project involves the participation of businesses, organizations and community associations. ●The Brand of Companies Enhancing Corporate Value through Health and Productivity Management was established jointly by the Ministry of Economy, Trade and Industry and the Tokyo Stock Exchange to select companies strategically implementing employee health management from the perspective of the company's management. Health management revitalizes organizations through improved productivity and employee motivation, which as a result can boost performance and the company's stock price. 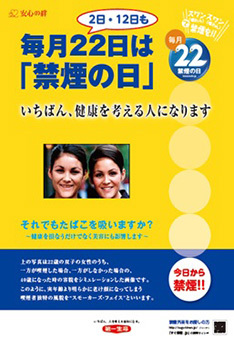 Dai-ichi Life announced the Dai-ichi Life Group Health Declaration entitled ”Iki Iki Dai-ichi 110“ in July 2011. In April 2013, in addition to the ”Health Promotion“ principle being added to the Dai-ichi's Social Responsibility Charter (DSR Charter), the Basic Policy on Health Promotion was newly established. Furthermore, the Work Smart Special Committee was established under the Committee for DSR* Promotion, which in turn is under the direct control of the president. The Plan-Do-Check-Action (PDCA) cycle is also being used to strongly promote the principles of health management. As well as the internal PDCA cycle, Dai-ichi Life joined the KENKO Enterprise Group actively working to promote employee's health and we are going to improve the activities. * KENKO Enterprise Group: A consortium of companies actively working to promote employee's health advancement through the leadership of their executive management established in June 2015. The primary goal of this consortium is to address common health advancement themes and increase the level of efforts through mutual benchmarking. * By Your Side, For Life - With You Project: This is a customer-oriented domestic growth strategy. By thoroughly recommending the undertaking of further medical examinations (”secondary examinations“) after regular medical checkups, and by also acting as a company that fully supports special checkups and special health guidance sessions conducted by the health insurance association in response to metabolic syndrome, Dai-ichi Life has worked to lower the prevalence of abnormal findings* discovered during the regular medical checkups of its employees. 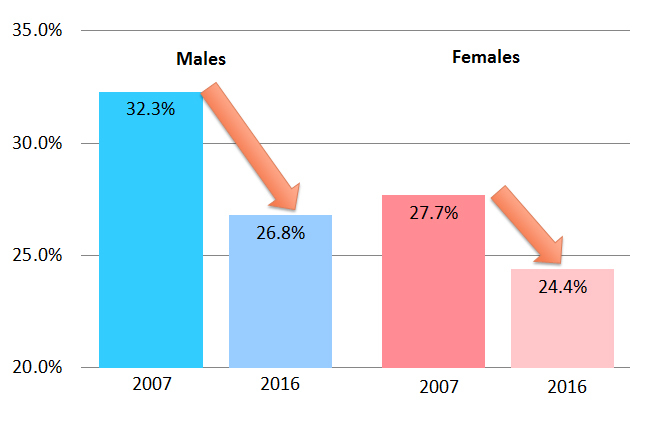 Thus, the health of the company's employees is improving steadily, while the prevalence of abnormal findings has fallen. A ”MammoBus“ mobile screening center that operates nationwide. 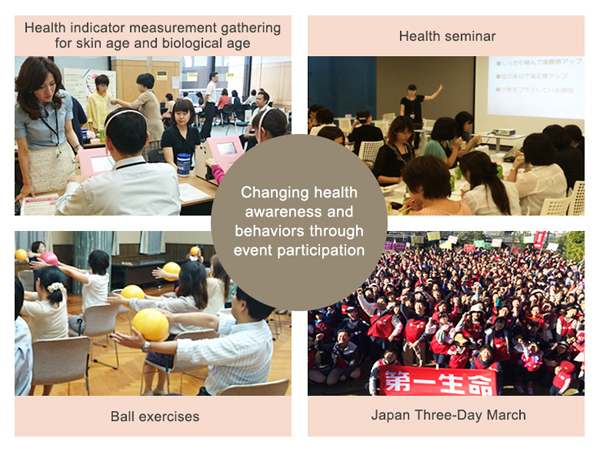 At the Dai-ichi Life, health seminars and health indicator measurement gatherings are held for health issues of each office throughout Japan as an opportunity for employees to improve their lifestyles. In addition, we have promoted a company-wide approach to health advancement that includes making one month in the fall of every year Dai-ichi Life health advancement month, during which the health advancement campaign and health events are held. This initiative is carried out jointly by Dai-ichi Life, the health insurance association, and labor union, and continues to attract more and more participants with each passing year. In addition, in fiscal 2016 we introduced a Health Point System that provides an incentive related to initiatives to advance the health of all employees. By recording data such as steps taken or weight using a smartphone or personal computer, we hope to increase the number of people maintaining healthy exercise habits. We have expanded "smoking-free day," which falls on the 22nd of every month as promoted by the Tobacco Control Medical-Dental Research Network to include all days of the month with a two (2nd, 12th, 22nd). Activities include closing of some of the smoking rooms within the corporate headquarters and other offices. Posters that highlight the importance of quitting smoking are also displayed, with measures being taken to reduce the percentage of employees. Furthermore, progress has been made in helping employees quit smoking, such as anti-smoking seminars for each office, anti-smoking campaign and the subsidies paid to offset whole expenses of outpatient treatment for anti-smoking. Due to such measures approximately 200 employees successfully quit smoking each year.